Another great year for the Championship with several new members and a general increase in the numbers competing. Congratulations to Nick Smith on winning the Championship and to all the award winners and competitors. 32 TR Register members entered the Championship this year, an increase of 6 on 2015, with the Castle Combe track day acting as a catalyst for this. There were 7 entrants in Class 1, 12 in Class 2 and 13 in Class 3, with some entrants using cars from more than one class during the year. There were seven non-TRs being driven. 28 competed at events, an increase of 7 on last year. The average turn out at events was 6.1 competitors compared to 5.2 last year. The average number of events per competitor was 4.8, lower than last year, with the highest being 11 by Roger McEwen, followed by Tom Purves and Martin Paine with 9. It is recognised that these figures have been corrupted by visits to the Armco, exploding engines and other car failures. Eleven competitors scored the maximum points at an event, with Nick Smith scoring six maximums, and Dale Huxford scoring 4. Seventeen competitors did the required 5 events to count for the Championship another increase over previous years. The best supported event was the autumn Gurston Down Hillclimb with 14 Championship competitors, closely followed by the equivalent spring event with 13, and then Abingdon, Castle Combe short, Prescott and Castle Combe long with 12. Two events on the calendar, Werrington and Ty Croes, did not have any Championship representation which is very disappointing to the Championship and the event organisers. There were two new events on this year's calendar, a sprint at Blyton Park run by the Westfield Sports Car Club, and a hillclimb at Manor Farm run by Woolbridge Motor Club, that were not well attended. 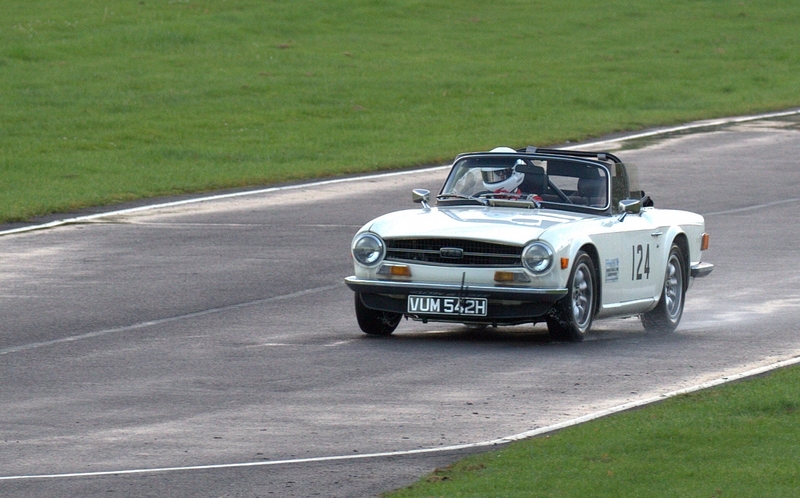 The Championship held Test Days at Castle Combe and Blyton Park that proved very successful, with a good turn out of TR Register members in many varieties of Triumph. Thanks go to Kev Bryant for organising these so well.